We are first and foremost professional curtain makers. Our focus is on quality, and making the best possible curtains which you can enjoy for years to come. ​ Almost all our curtains are hand-crafted, lined and interlined for a more luxurious finish. ​We work with clients to design curtains in different styles, fabrics and colours to suit the type of window and the decoration of the room. There is a choice of headings and linings to suit your preferences. We provide a totally personal service from consultation and design advice, to hanging and dressing your new curtains for you. The finest quality curtains are almost entirely hand made. It is in this method of 'hand-construction' that the best finish is guaranteed - and through which the top quality drape and handle and a luxurious look are achieved. Layers of fabric are carefully crafted, with attention to detail, so that the final curtains hang beautifully and look wonderful for many years to come. See the stages involved below. 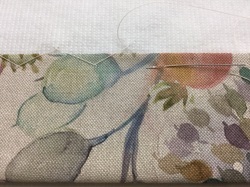 Here we made interlined curtains using a beautiful muted watercolour linen fabric called Hedgerow. They get admired and you love them! ​you'll never want anything less.